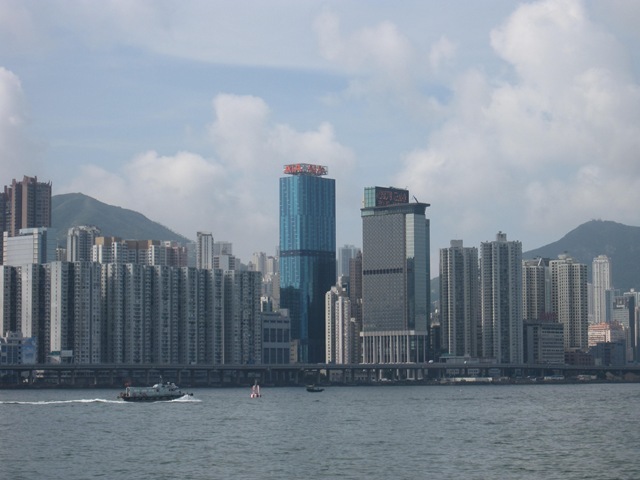 I chose a hotel in the Kowloon side of Hong Kong, which happened to be right on the harbor. After getting settled in and refreshed, I took a walk along the harbor and quickly noticed all of the tall skyscraper buildings on Hong Kong island as well as on the harbor on the Kowloon side. Hong Kong is full of tall, thin buildings—some very tall and others not so tall, but they are all around you and are used for both commercial and residential purposes. After my stroll, along the harbor, I walked over to the Hong Hum Ferry station to take a quick ride on the Star Ferry line to Hong Kong island. I was told by a former resident of Hong Kong that every one who makes it to Hong Kong must take a ride on the Star Ferry…so that I did. A fairly quick ride between islands, the breeze was very nice on a hot day in Hong Kong. The views of the skyline and skyscrapers of Hong Kong Island become much more visible on a somewhat hazy day and you quickly notice familiar brands with large building presences there: Canon, China Mobile, Epson, Panasonic and more. 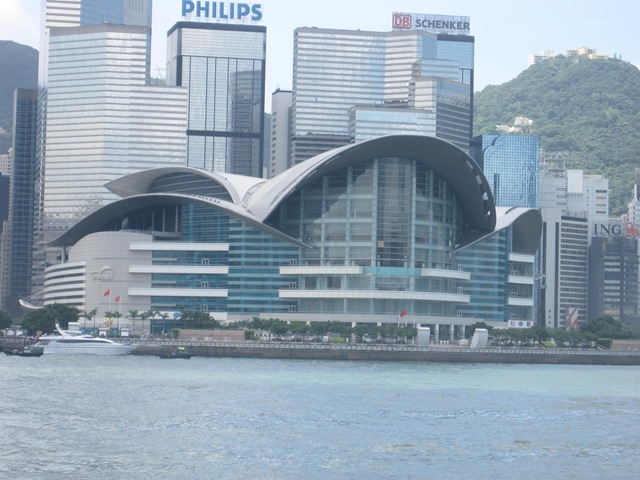 Also, one of the more notable buildings along the Hong Kong island side of the harbor was the Hong Kong Convention and Exhibition Centre, which juts out into the harbor more than the rest of the neighboring buildings. The convention center feels like the centerpiece building of the harbor and visually reminds me of the Sydney, Australia waterfront, where I’ve never been, but have seen on television. Residential buildings suggest small living sized units, I would guess smaller than most large, urban cities. 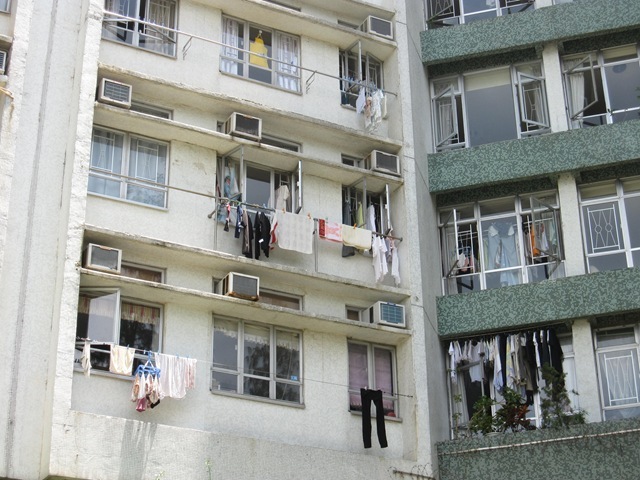 Hanging clothes outside the windows was very common. I saw this in India and very much the same situation in Hong Kong. Walking around and noticing locals and other Hong Kong or Chinese tourists I assume, you could quickly see the affinity to brands. Many shirts with brands such as Puma and others were being worn. While I may have been in a more touristy part of town so it may not be as representative of the whole area, the area was very clean. Streets and the ferry stations were all free of litter and well organized. At the Hung Hom Ferry station, I noticed many more Apple iphones as a proportion of the phones that the locals and Asian tourists were carrying than I would expect. Perhaps, another sign of the affinity to brands and latest consumer electronics gadgets for Asians. I noticed a similar phenomenon with cameras—many more expensive SLR cameras with large lenses as a proportion of total cameras that I saw compared to what I would see in the US. After the ride on the Star Ferry, I took a bus shuttle to the Tsim Sha Tsui area of Kowloon. A high-end area, I noticed lots of nice hotels, shopping, and restaurants in the area. My trip there was centered on one thing: to get good local Dim Sum. I was told that the East Ocean Restaurant was one of the more popular Dim Sum restaurants in Hong Kong so I found my way there and got settled in for a nice lunch. A family place, you saw groups of patrons filling up large tables. Not a very seasoned Dim Sum eater, I ordered some basic chicken and seafood dishes. 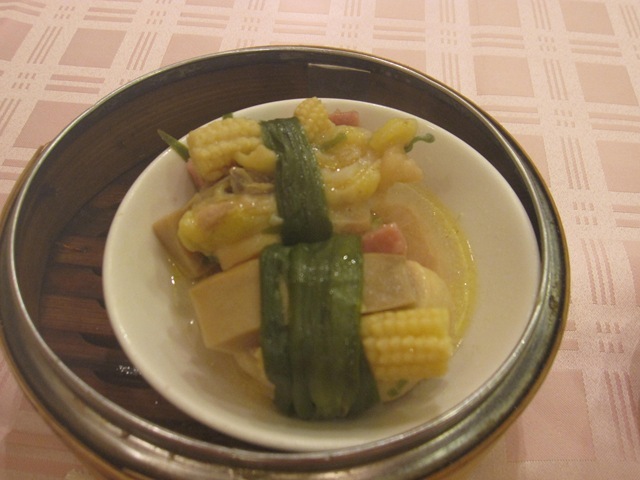 Nice food, however, much more of an experience for me than a culinary delight given my limited seafood and meat diet. The bus meandered its way through town up to Victoria peak. 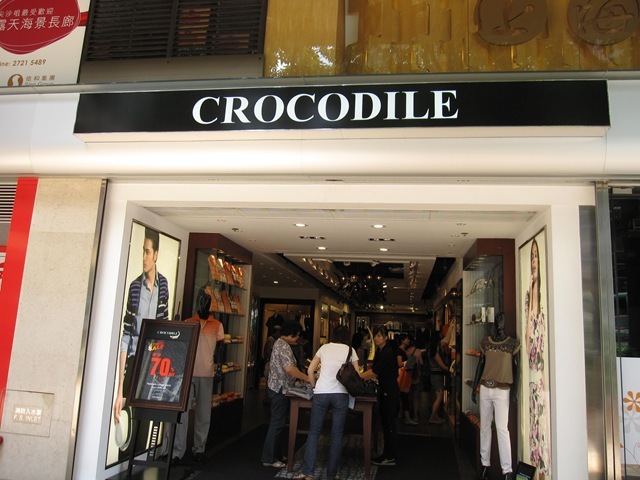 Clearly a top tourist site, it had the usual tourist concept restaurants, shopping and tour guides. 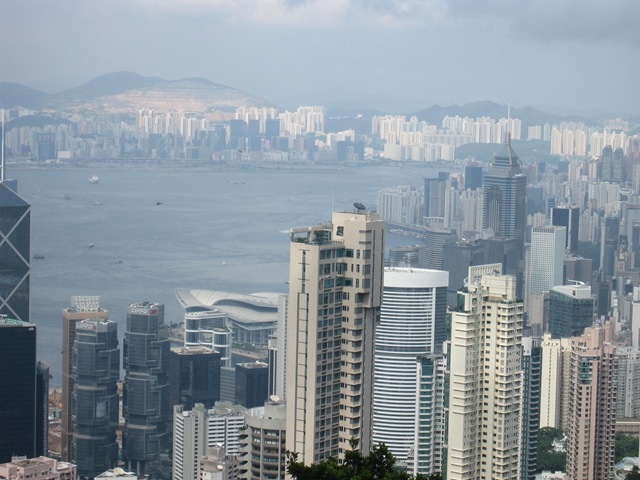 While it was a hazy day, the view from the top was quite vivid, all around views of the skyscrapers, harbor and the overall urban scene of Hong Kong. I was there in the afternoon but realized this would be quite an amazing scene at night time. From there the bus made it to Aberdeen fishing village. Turned out this wasn’t the most exciting stop, but I did get a chance to go in a small motorized boat through the harbor, pass the Jumbo Floating Restaurant, and see some other fishing vessels with locals who appeared to live in the boats. Then upon leaving the fishing area, the bus stopped at a jewelry store and factory for some shopping, which I think was really a tourist trap. I don’t believe Hong Kong’s jewelry business is considered one of Hong Kong’s more unique or important industries, the tour pitched it as such and took the group there for a lecture on the history of the factory, a view of the jewelry making activities and then a walk into a large showroom for discounted captive, shopping. A practice I’ve seen by tours around the world including Italy, India and elsewhere, appears Hong Kong is no different. From the jewelry showroom, the bus ventured to Stanley Market. 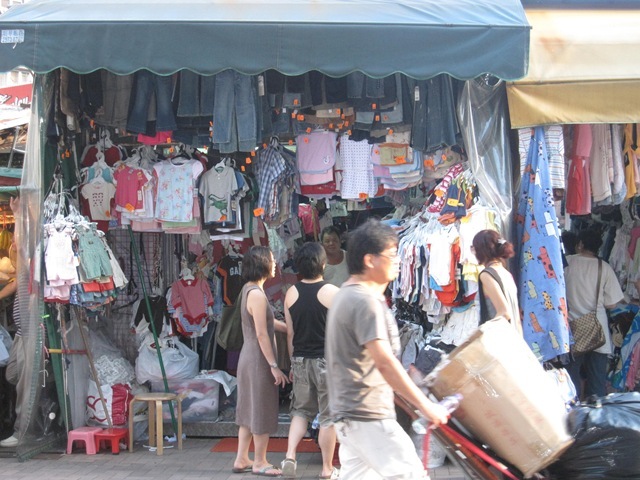 A vibrant market with food, local trinkets, handbags, clothes, and other shopping options, it was serving primarily tourists and some locals. I always like going to local markets to get some glimpse of local flavor. While driving through the parts of the island to get to Victoria peak, I noticed many more sports facilities than I would have guessed: tennis courts, basketball courts, and soccer fields. Interestingly, when I opened up the local English language Hong Kong daily newspaper, English Premier League soccer articles were the lead articles in the Sports section. The tour was quite prompt; the bus first left probably 2 minutes after the original time listed and at one of the stops, even attempted to leave a couple of minutes early from the stated time to get to its next stop on the tour. I suppose based on the UK history of Hong Kong, I noticed that all of the street signs were usually listed in English as well as Cantonese. During the drive through residential areas and subsequent walks, I didn’t notice many pets on the roads or parks. I suppose that is related to where I was at, primarily in residential and commercial areas with small homes and hi-rises where pets may not be allowed or have enough space to live comfortably, but it definitely felt like less pets than other parts of the world. Of course, if I made it out further to perhaps the New Territories where it may feel more residential, I expect there would have been more pets. Many high end brands of vehicles near Tsim Sha Tsui—a good amount of BMW and Lexus cars. However, some of the stereotypes of Hong Kong mafia and gangs from movies I’ve seen like Rush Hour turned out to be true- I read in a newspaper article about a mafia killing of a Triad gang leader by the opposing Sun Yee On group at the high-end Kowloon Shangri la hotel on trendy Mody Road in Kowloon occurred in the Tsim Sha Tsui area. After the tour ended and I returned to my hotel, I went off to dinner with my cousin and his wife, who I hadn’t seen in years and for the first time in Hong Kong. We went to a nice Indian/Thai restaurant in the Kowloon area by taxi. While the food was labeled Indian/Thai, I found that the food consisted of either Indian dishes or Thai dishes, but really didn’t fuse the two cuisines together into single dishes. Good food, but the service was lacking. While certainly not universal, I think a general observation of Indian restaurants anywhere in the world would be that their service is a bit sub-standard. After dinner, we then hopped into a public transportation bus around 10 PM and it made it back to my hotel. On the way, we drove by some still very active street scenes— outdoor food markets, restaurants, and some night time bars and clubs. 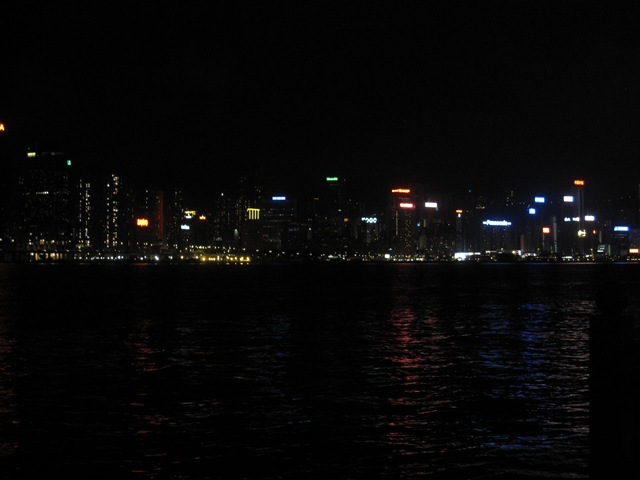 Hong Kong certainly is active at night and I understand has a very active nightlife scene. Finally, back at the hotel, I took one last stroll along the harbor to see the skyline at night—certainly an illuminating sight. Public transportation buses were quite nice. Air conditioned on a hot day and from what I’m told, very safe at all hours of the day. Public transportation is very available and used frequently in Hong Kong, an area with space constraints and consequently, very expensive parking options which limits the amount of vehicles and who has those vehicles. I saw some police, more so in the evening—it appeared that the police generally used more vans as the primary vehicle than I’ve observed elsewhere. Overall, a very nice day in Hong Kong which has wet my appetite for a longer, more intimate visit. I regret not having the chance to see more local scenes of Hong Kong which would be my primary goal next time. 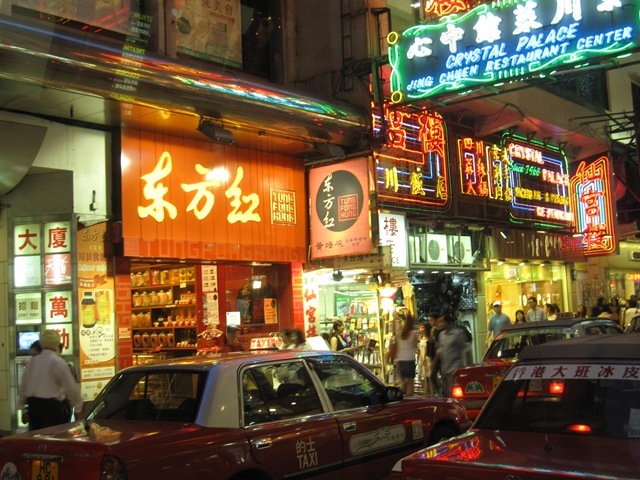 If I could have done it over, I would have substituted the Sheung Wan area for the Aberdeen Village, which I understand to be more of a local scene of Hong Kong and I would have spent some time on Nathan Road at night, which I understand to be the real center of Hong Kong’s night life. Overall, Hong Kong had a very strong urban feel and reminded me of a combination of New York, Mumbai, and San Francisco. As a famous future governor of California once said, I’ll be back. Nice travelogue. We had booked a hotel in kowloon. We took the boat ride from Hong Kong to Kowloon to go to that hotel. We were overcome with emotion (due to watching the movie, The World of Suzie Wong, several times). In the boat, I turned around and told my wife: This is exactly the place where William Holden met Suzie Wong. Thanks SG for your comment…it was definitely a nice experience and a place I will spend more time. I haven’t seen that movie, The Wold of Suzie Wong– I will have to check it out.